Thigh lift (also known as thigh reduction) involves the excision of loose, unwanted excess skin and is commonly requested by men and women who have experienced massive weight loss. It is not primarily a fat removal procedure, and although some adjacent fat is often removed with the redundant skin, it should not be considered as weight-reduction or fat removal surgery. Nor should it be considered a body-perfecting procedure; it is designed to improve the overall shape of the upper leg, and reduce discomfort caused by excess skin such as chaffing, hygiene challenges and skin irritations. The photos. 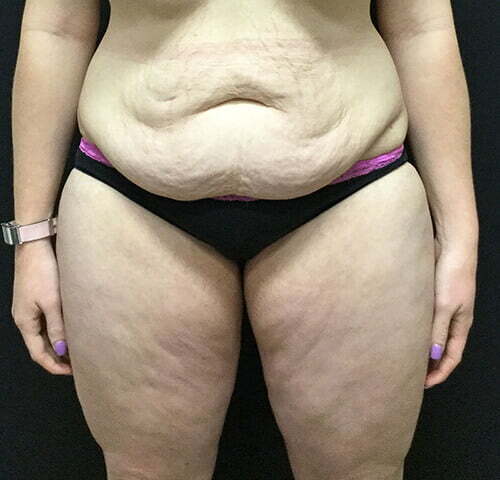 below show before and after thigh lift surgery with Dr Sharp at 3 months post surgery while still in their early stages of development, still swollen and presenting contour irregularities. Scroll down to see photos of mature scars. Small drains (tubing) will be placed inside your thighs during the surgery. These drains remove the blood and fluid that your body produces inside your wounds, and collects in drain canisters that will be emptied and measured regularly to monitor your drain output levels. Sometimes due to your legs’ lymphatic system being disrupted by the surgery, your legs’ normal drainage may not naturally eliminate this fluid, and due to high volume of fluid in the drains they may need to remain in your legs after you are discharged from hospital. If this is the case, you may need to take more time off work or delay returning to normal duties such as driving, household tasks or looking after family members. It’s important to consider the impact of this on your wellbeing, state of mind and income if this occurs. Drain removal is normally not painful and is performed by our nurse in our rooms when your drain output levels indicate they are ready to come out. The risk of complications such as wound dehiscence, seromas and delayed healing are higher in thigh reductions than other lipectomy (skin removal) procedures due to the amount of tissue resected and the location of the incisions - which are unavoidably placed under some degree of strain every time you move post operatively. You will need to weigh up the benefits thigh reduction surgery with the possibility of these complications occurring, and the impact they may have on you, as mentioned above. have private health insurance that covers lipectomy surgery - this is so you don’t experience any unexpected out of pocket hospital fees if your inpatient stay is longer than expected, or if you experience a complication and require readmission to hospital, costs are therefore not a factor that impact the decision making around your clinical care. commit to a 2 week inpatient stay in hospital following the procedure - this is because in the past we have found that patients who go home earlier may accidentally over extend themselves or find it difficult to adhere to post operative restrictions on movement and the use of compression garments, increasing their risk of costly complications and post operative dissatisfaction. Have a BMI of 30 or less. Sometimes, liposuction is used in conjunction with thigh lift surgery to debunk small areas of stubborn fat pockets. The remaining loose skin following liposuction can be removed as part of the thigh lift procedure. However, if you desire general de-bulking of large amounts of thigh fat that has not successfully reduced in the past through healthy lifestyle choices and exercise, thigh lift surgery is not the solution. We recommend seeking the assistance of your GP who may refer you to range of weight loss professionals depending on your medical history including a dietician, endocrinologist or bariatric surgeon. It’s important to consult more than one surgeon when considering this procedure, as your relationship with your surgeon should be a life long one, and feeling comfortable and understood by your surgeon is of upmost importance, so its crucial to choose a doctor that you have good rapport with. Be sure to ask questions; it’s very important to understand all aspects of your thigh lift. - Healthy individuals who do not have medical conditions that impair healing or increase risk of surgery. This surgery is not suitable for smokers. One of the most common techniques used for a thigh lift places incisions in the groin, extending downward and wrapping around the back of the thigh. The underlying tissue matrix will be reshaped and tightened, and skin will be reduced and redraped resulting in more proportionate and smoother body contours. You may qualify for a minimal incision medial thigh lift that involves an incision only in the groin area. Your surgeon will determine if this is appropriate. Improving the contours of the outer thigh may require an incision extending from the groin around the hip. Advanced techniques usually allow incisions to be placed in strategic locations where they can be hidden by most types of clothing and swimsuits. However, incisions may be extensive. During your recovery from thigh lift surgery, dressing or bandages may be applied to your incisions, and you will come out of theatre wearing a compression garment to minimise swelling and to support your new contours as you heal. Small, thin tubes (drains, as per above) will be temporarily placed under the skin to drain excess fluid or blood that may collect. Following your surgeon’s instructions is key to the success of your surgery; all patients leave hospital with their incisions in optimal condition, what happens to your surgical site from there is dependent on how well you care for your wounds at home, how closely you adhere to your post operative instructions, staying in touch with our clinical team with any concerns and attending your post operative review appointments diligently. Patients stay in hospital for 2 weeks post operatively and return home to very light duties (ie only lifting light objects, short very slow walks and no squatting or vigorous activity) for at least 6 weeks. After this time, patients can very gradually ease back into normal activities, carefully monitoring their legs for swelling, discomfort or signs of recovery regression. Swelling and bruising will be extensive during this period. Sometimes - particularly if post operative garment wearing and activity instructions are not strictly adhered to - some patients can be naturally prone to more swelling than others. If this is the case, excessive swelling can place pressure on the thigh reduction incisions and wound dehiscence can occur. While this can be a frightening experience, it is usually very easily repaired with some additional stitches to the area. If dehiscence occurs superficially - meaning only the top external layer of stitches come open, but the internal layer remains intact - this is usually due to physical activity pulling on the tight incision, premature removal of surgical tape covering the incision, swelling placing extra pressure on the wounds or inconsistent use of the compression garment too early. Sometimes the wound might not be stitched closed but instead allowed to heal through a carefully monitored granulation and wound dressing process managed by our wound care nurse under the direction of Dr Sharp. Strategically using this method when appropriate - whereby the body heals the wound from the inside. The images shown here are an example thigh reduction scars at 12 months post surgery; individual results may vary. You will be given specific instructions that will include how to care for the surgical site and drains, medications to apply or take orally to aid healing and reduce the potential for infection, specific concerns to look for at the surgical site or in your general health, and your complimentary follow up appointments with our nurse and Dr Sharp during the 6 months after your surgery. It is important to attend these consultations so we can ensure optimal healing and support your recovery process. What happens if I am unhappy with my thigh reduction scars? If prominent scarring results from wound dehiscence this is usually treated from 3 months post surgery with conservative non surgical treatments such as Fraxel laser, micro needling or prescriptive topical therapies. If scars do not respond to this treatment, surgical scar reduction can be undertaken, although it’s important to remember that this will also involve a secondary recovery process. - Where will I be taken after my surgery is complete? - What medication will I be given or prescribed after surgery? - Will I have dressings/bandages after surgery? When will they be removed? - Are stitches removed or are they dissolvable? - When can I resume normal activity and exercise? - When do I return for follow up post op care? Will weight gain or loss impact my results? Yes , that’s why it’s important to have this procedure when you have reached a stable and sustainable weight. Weight loss and weight gain will impact your results. Also, ageing will inevitably affect your results; as your body ages, it is natural to lose some firmness. However, most of your initial improvement should be relatively permanent. What if I am not happy with my overall thigh reduction results? Although good results are expected from your procedure, surgery is not an exact science as each patient’s body handles the surgery and recovery process uniquely, so there is no guarantee that your procedure will achieve the results you hoped for. In some situations, it may not be possible to achieve optimal results with a single surgical procedure and another surgery may be necessary. The decision to have plastic surgery is extremely personal, and you’ll have to decide if the benefits will achieve your goals and if the risks and potential complications of thigh lift surgery are acceptable. Dr Sharp provides a very detailed informed consent document outlining possible risks and complications at your first consultation, along with a pamphlet from the Australian Society of Plastic Surgeons that explains the surgery risks again in detail. Dr Sharp will go through this documentation with you during your first consult, and he will also ask you to take these documents home and re-read them before committing to proceeding with the surgery. If there is anything you don’t understand in these consent forms, it’s important to raise these with your surgeon prior to signing the document and proceeding with surgery. These risks and others will be fully discussed prior to your consent. It’s important that you address all your questions directly with Dr Sharp. - General anesthesia: Drugs and/or gases used during an operation to relieve pain and alter consciousness. - Hematoma: Blood pooling beneath the skin. - Intravenous sedation: Sedatives administered by injection into a vein to help you relax. - Liposuction: Also called lipoplasty or suction lipectomy, this procedure vacuums out fat from beneath the skin’s surface to reduce fullness. - Local anesthesia: A drug injected directly to the site of an incision during an operation to relieve pain. - Medial thigh lift: A surgical procedure to correct sagging of the inner thigh. - Outer thigh lift: A surgical procedure to correct sagging of the outer and mid-thigh. - Sutures: Stitches used by surgeons to hold skin and tissue together. If you are seeking a thigh reduction for cosmetic reasons only, there is no need to obtain a GP referral to see Dr Sharp. If you are having a thigh lift for medical reasons, such as excess skin after massive weight loss, please obtain a referral from your GP to see Dr Sharp so you can access any applicable rebates. Call 3202 4744 to book an initial consultation with Dr Sharp. During this initial consultation, expect to be with us for approximately 60 minutes so you have plenty of time to discuss the procedure and any questions with Dr Sharp and you will also receive a detailed information pack and quote.